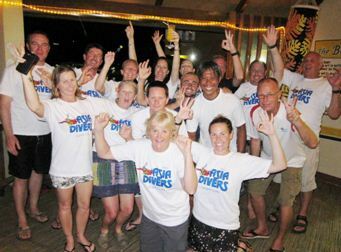 A great week with Dolphin Scuba | . This week we welcomed Dolphin Scuba all the way from Australia Perth. The guys at Dolphin Scuba heard about Asia Divers a couple of years ago when they met Allan and Tommy on their tour around Australia, so they decided to come over and find out what all the fuss was about. It’s been a fantastic week with great weather and even better diving with sightings of Hairy Frog Fish, Soft Coral Crabs and Pygmy Seahorse, not to mention the great drift dives at the Canyons and Verde Island. Special thanks to Emma and Ben for putting the trip together.